In its core Dragon1 views Enterprise Architecture as a Total Concept for an Enterprise. In general Dragon1 sees the Architecture of a Structure as the Total Concept (with coherent set of Constructive, Operative and Decorative Concepts) of that Structure. 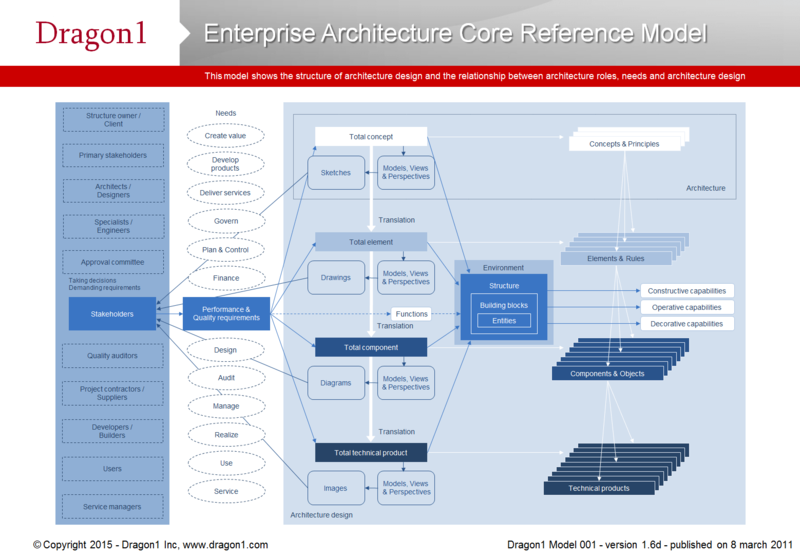 The Dragon1 Enterprise Architecture Core Model shows a generic decomposition of an architecture of a structure with its mot important entities and relationships. Dragon1 enables you to create a conceptual blueprint for the organization's strategy using an innovative Enterprise Architecture approach.